It was only a short drive through the village to the Van Vihar guest house where the wood was crackling merrily in a campfire and a few travellers were sitting around it. Hari – the owner of the place welcomed me and showed me into my room that was rather shabby but looked like a rural palace to me after my long journey. When I came back out to the fire, I met the three guys that I saw when I first arrived, and they told me that they already had a jeep booked for the morning safari and that they were happy for me to join them. With that organized, I had a quick dinner and went to bed. The evening was so cold that I was forced to wear every piece of clothing that I had in my backpack except for the jacket and the boots. The positive side of this arrangement was that it provided enough cushioning to be comfortable on the mattress that was as soft as a slab of concrete. And as I was falling asleep I was thinking about a tiger prowling through the jungle on the lookout for an unwary deer, stepping soundlessly on the forest floor. The morning came with a knock on my window and someone’s voice announcing that it was time for breakfast. I glanced at my watch – it was 5.30am. Reluctantly I crawled from under my blankets, put on the boots and the jacket, brushed my teeth, wrapped myself in a light blanket and stepped outside. I all but ran to the fire that the kitchen boy lit some time ago and was already cooking breakfast. The two Irishmen and a Frenchman were already sitting around the fire, drinking coffee and waiting for their eggs on toast. I ordered my breakfast and watched the local cooking techniques in fascination. The stove was constructed from two brick legs with a fire burning between them and a sheet of metal with a hole in the middle lying across the top. The kitchen boy held a block of butter over the fire for a few moments and when it was soft enough he smeared one end of it on the pre-toasted pieces of bread. The eggs were then cooked in a conventional fashion in a frying pan and put out on a plate with the toast. It tasted delicious and with a supplement of a hot cup of coffee, it made my blood run a little bit quicker – just enough to stop shivering. As soon as we finished our breakfast we were introduced to Devi, our safari driver and ushered to his open jeep that in India is called a jeepsie. The guest house was only 400 meters away from Kanha National Park’s gate and by 6 am we were already querying up at the entrance. It is a government regulation that every vehicle entering the park must be accompanied by a forestry guide at all times at a cost of 100 rupees a day. When our turn came we paid our fees picked up a guide and finally drove through the boom gate into the park. The sun was just starting to rise but the air was still chilly. We wrapped ourselves tighter in our blankets and I thought that we looked more like Afghani refugees than like western tourists. 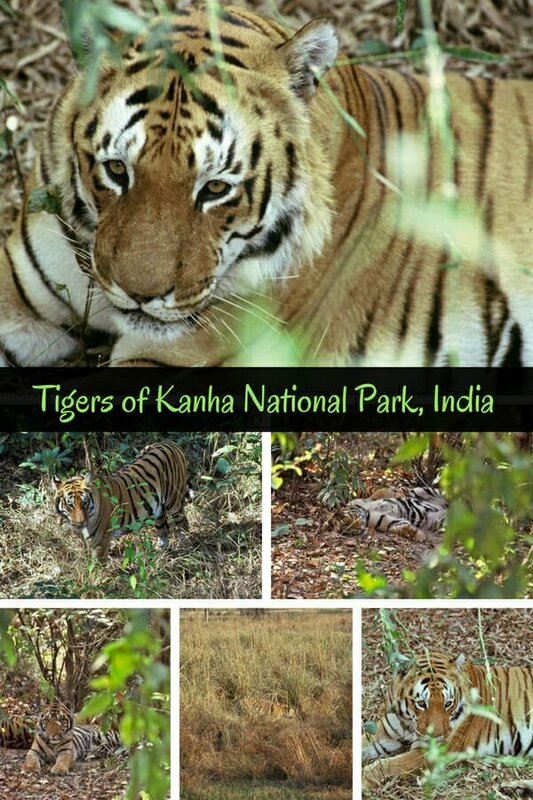 Kanha National Park is located in the Maikal range in the eastern sector of the Satpura Hills of the Central Indian Highlands. 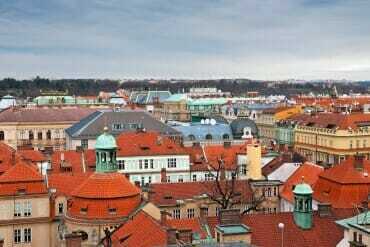 The park consists of the core area of 940 km², which is surrounded by a buffer zone of 1,005km², thus comprising a total area of 1,945km². The conflict between people and tigers existed ever since people moved into the area of tiger habitat, cleared the land for settlement and agriculture thus entering into competition with tigers for available space and food. 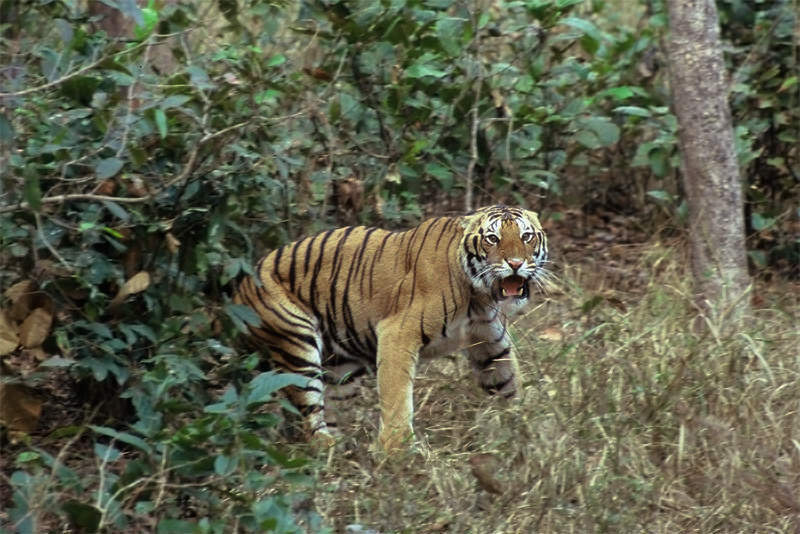 Historically this conflict was manageable: tigers occasionally killed livestock and people hunted tiger’s prey and occasionally killed tigers themselves. However, as the human population kept expanding, the human-tiger conflict began to increase. Hari Yadav, the owner of the guest house where I was staying lived in Katya village on the outskirts of the reserve all his life. For generations, his family ran a cattle farm. In the early 1900s the government officials took to hunting deer in the reserve and before long their hunting efforts wiped out almost all dear in the park. Deprived of their natural prey tigers were forced to switch to an alternative food source – domestic stock. 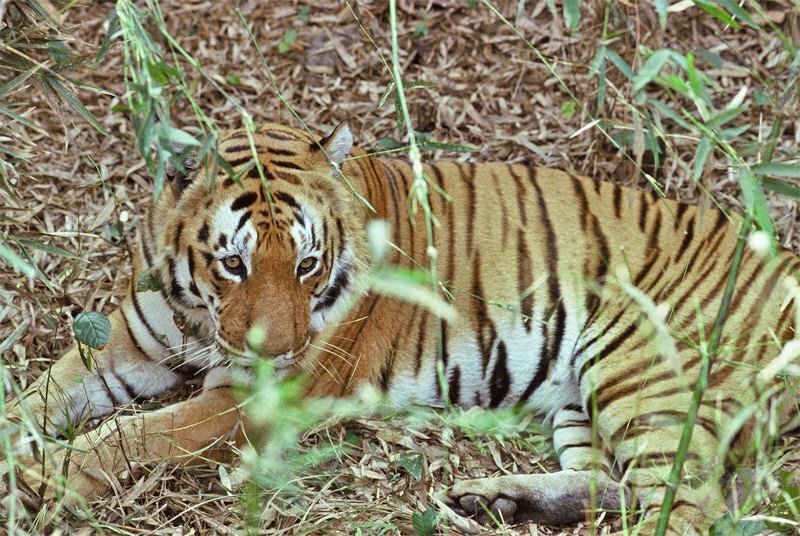 As an aftermath in just two years, Harry’s family lost all of its 200 cattle to the tigers. But luckily, by then Kanha was declared a National Park and flocks of ecotourists started to arrive, bringing new business to the village. This story is reminiscent of Jim Corbett’s transformation, where he went from a hunter specializing in tracking down tigers that preyed on the domestic stock to a conservationist. And now one of India’s National Parks is named after him – Jim Corbett National Park. As the day wore on it finally started to warm up. As each of us in the jeep started peeling off layers, a large pile of clothes built up on the floor of the jeep. We drove through the forest listening to alarm calls and looking for tiger pug marks on the road. As the air warmed up Chital deer descended to the valleys and langurs came down to forage on the ground, always on the lookout for a tiger, just like we were. 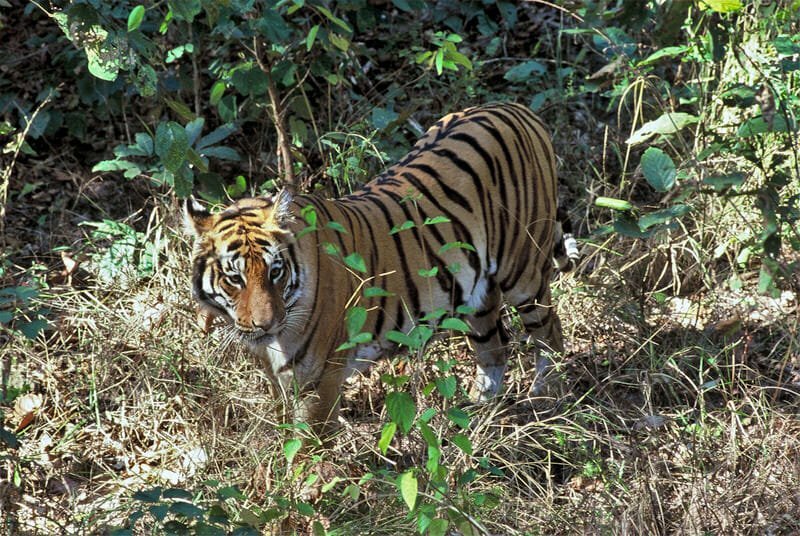 The results of the 2001 tiger census claim that there are 123 tigers in the reserve. While official results of tiger census in India tend to be an overestimate it was obvious that tigers in Kanha are quite abundant. In ten days that I spend in the park, I saw tigers basically every day. 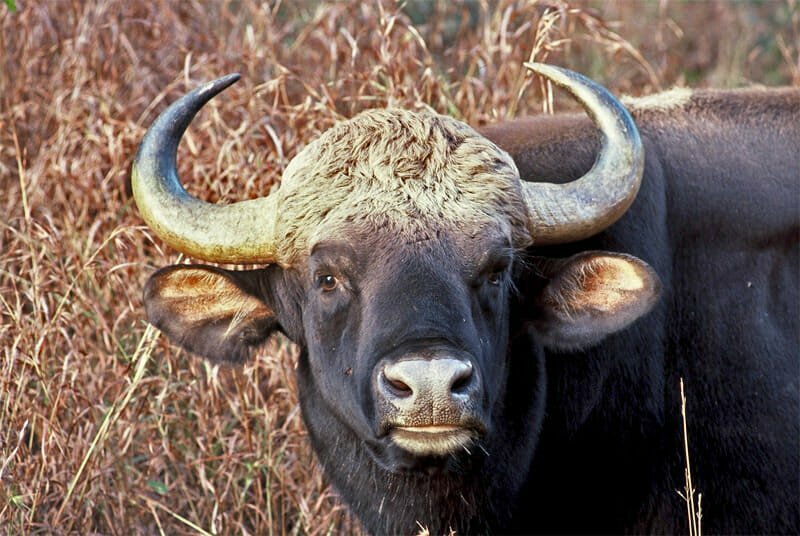 Sometimes they were tracked in the dense forest by the mahouts on their elephants and other times tigers could be observed in the open particularly on the Kanha Meadow. I was lucky enough to see a variety of individuals and behaviours. 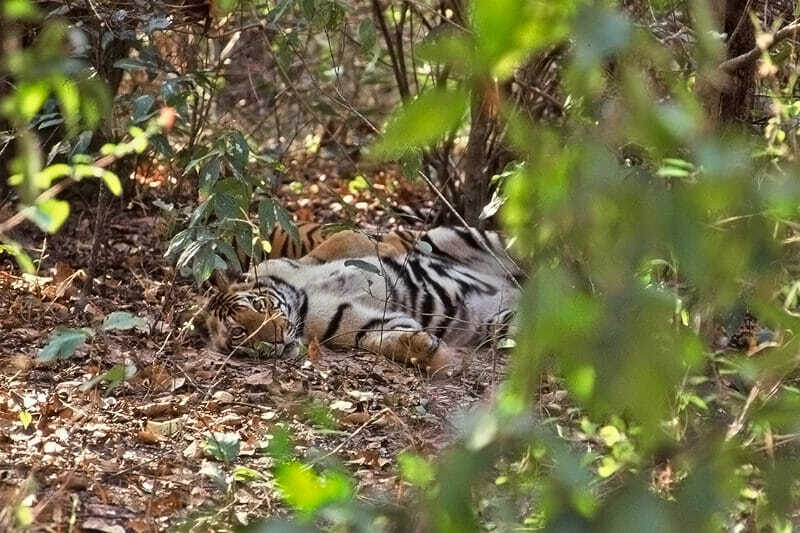 Early in my stay I saw two tigers courting at Kisli, later on I caught a glimpse of a tigress with two cubs, One afternoon just before sunset I watched a big old male walking along the road and then disappearing into the tall grass of Kanha Meadow and on my last day in the park my elephant was charged by an adult male tiger. It was such a privilege to come into the world of these magnificent animals and to see them as they have lived for thousands of years. A lifelong dream fulfilled it was the beginning of a new life for me – a life of long-term dedication to one of the most beautiful creatures ever created – Tiger, the king of the jungle. The safaris in the park run in two sessions: morning and afternoon. Lunchtime is spent at the guest house. It is also the time for a shower, as it is too cold for it in the mornings. The kitchen boy usually provided a bucket of hot water on request while the locals usually opted for a cold shower from the well. After a quick lunch of lemon and sugar pancakes, it is time to go back to the park. My evenings were usually spent at the campfire back at the guesthouse. It was a good time to reflect on the day in the park and to share travel stories with the others. I stayed for nine days and I thought it was the happiest time of my life. Today mahouts tracked down a tigress with two cubs near the river at Mukki. The female made a kill last night and after gorging on it through the night, the family was relaxing in the dense undergrowth. The choice of the site was obviously important to the female. She hid the kill in the dense undergrowth that was safe enough to bring her cubs there, and that was close to the river so that the family could have a drink after they gorged on the kill. At first, I couldn’t even understand what I was looking at. All I could see was a lot of feet and a lot of stripes. I didn’t have to wait long, however, for the cubs to reveal themselves. While the mother stayed hidden in the bush the cubs were quite curious about the elephant and the strange creatures sitting on top of it. After a while, the female got up and led her cubs away, probably down to the river for a drink. Every morning mahouts at Kanha ride their elephants through the park in search of tigers. Once a tiger is located, the jeeps bring small groups of visitors to the closest point on the road, and the mahouts take them into the forest to see the tiger from an elephant’s back. 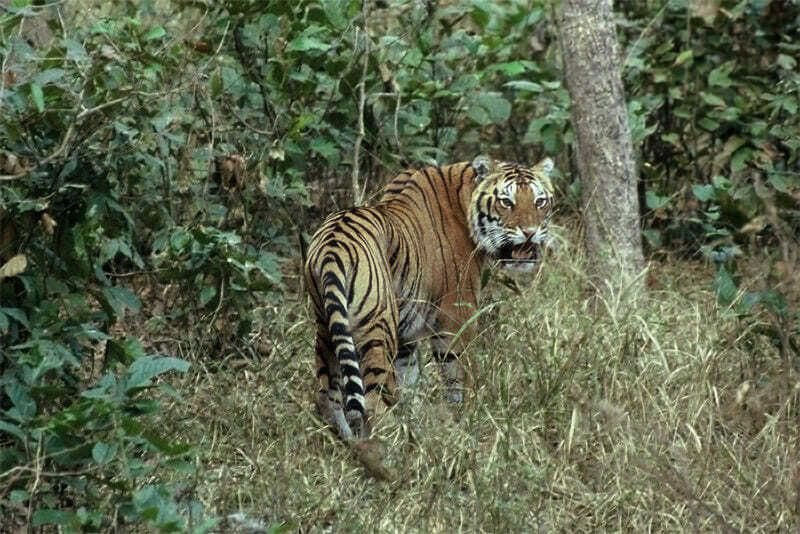 Though wild elephants disappeared from Khana many years ago, tigers are used to sharing the forest with them and are not bothered by their presence. Luckily, they also completely ignore people sitting on the elephant’s back. 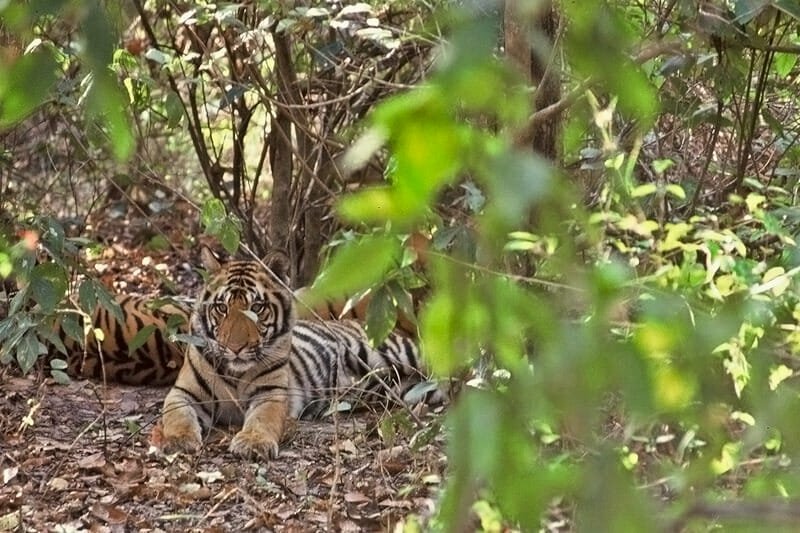 Today, two tigers were found courting in Kisli area. The tigress came out in the open and stayed in plain view sniffing the air. It was such a rare sight, that even the mahout pulled out a Canon SLR from the folds of his clothes and snapped a few shots. After a while, the tigress moved off and disappeared into the thick growth. We followed her. Suddenly, as the elephant we were riding was crushing through the jungle, a large male sprang out from his hiding place under a thick bush. He bared his teeth and roared at us before running off back into the cover of the thick jungle. The female seemed restless as well. She came out into the open and disappeared again. We followed her until we came across the male again. Our presence seemed to be irritating the animals, so we left them to their courtship and retreated back to the road. 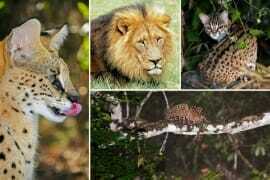 Late in the afternoon the forest suddenly exploded with alarm calls of langur and chital. 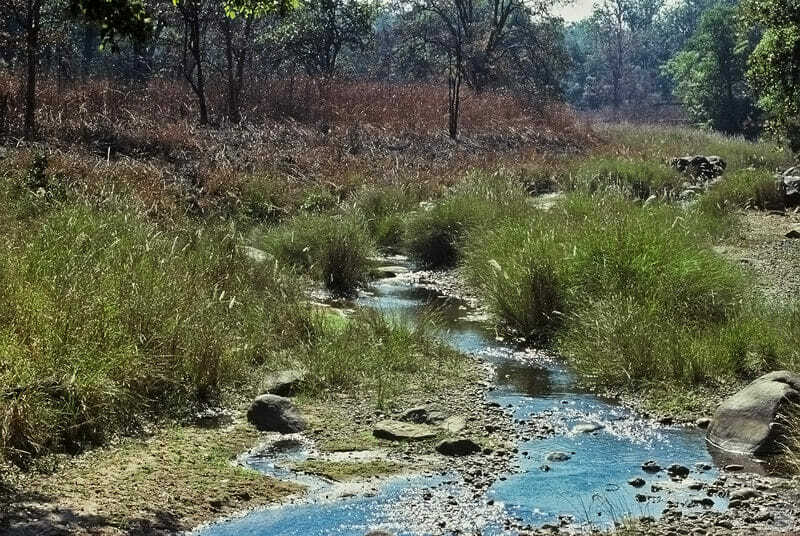 Following the calls, we came to the Kanha meadow and saw a tigress walking across it towards a small lake. She concealed herself in the tall grass of the meadow and seemed to be waiting for us to leave so she could cross the road and head off into the forest. Mahouts tracked down a young male at Bari Chubri rd at Kanha. This was a male tiger in his prime and he looked absolutely beautiful. By 9.30 am he still has not moved from the site. His relaxed and tolerant disposition together with his rounded belly suggested that he has recently made a kill and concealed it nearby. 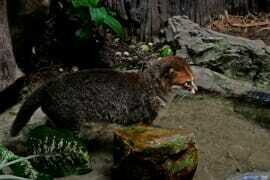 He will now spend a few days near the kill, feeding on it and guarding it against the scavengers. Pacified by his full stomach he took practically no notice of the elephants and allowed them to approach very closely. I felt that if I just stretched my hand down I could have touched him. 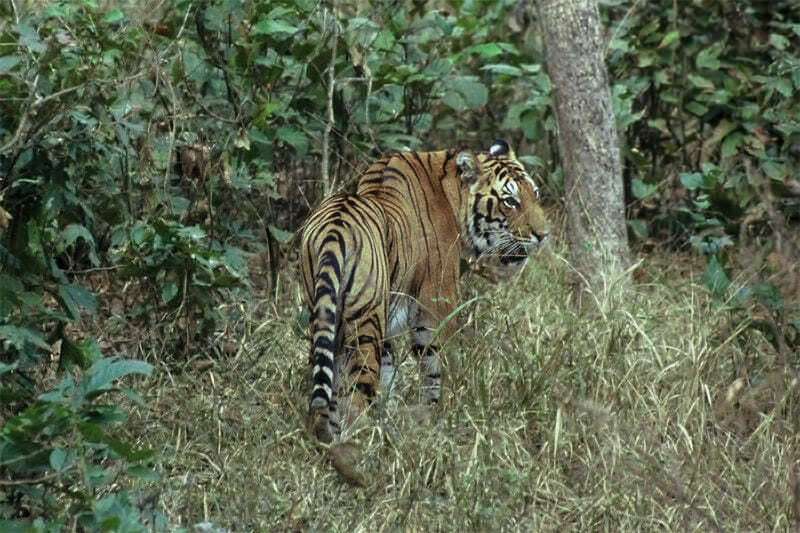 Late in the afternoon of the same day, we spotted a large male tiger walking along the road on Kanha meadow. He came out of the forest and walked slowly towards us for what seemed like an eternity. He had no fear whatsoever of at least a dozen jeeps full of excited tourists parked on the side of the road. When he was only two or three meters away from our jeep, I noticed that his face was covered with fresh scars. Since it was an old tiger, I figured that he must either be a resident male that had a fight protecting his territory or he was already dislodged from his old territory by a younger and stronger contender and was now a floater – a male without a territory. 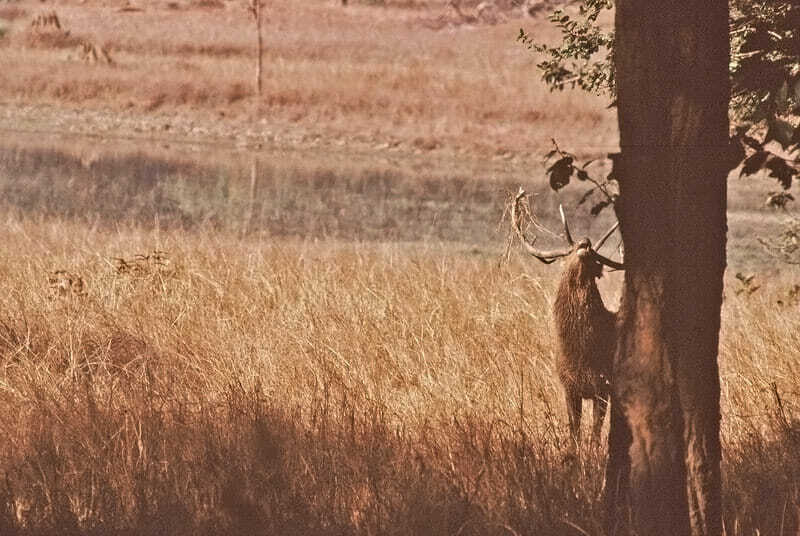 Considering where he was, however, Kanha meadow is the most prey-rich habitat in the park, it was unlikely that he was ‘floating’ through this highly contended piece of real estate. He continued to walk along the road ignoring the jeeps as he passed them and eventually walked off into the meadow away from the road. On my last day in Kanha, mahouts tracked down the resident male at Link #7 again. He was very restless and aggressive, kept charging the elephants and irritably jolting from place to place. As we tried to follow him, he turned around, pushed his ears back, and roared at us stirring up the entire forest. 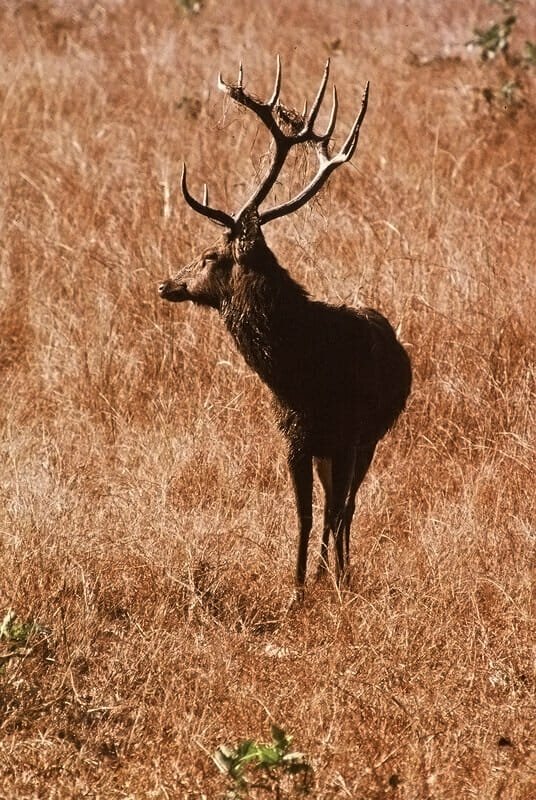 After the tiger, the most interesting animal in Khana is probably the Hard ground Barasinga or swamp deer. 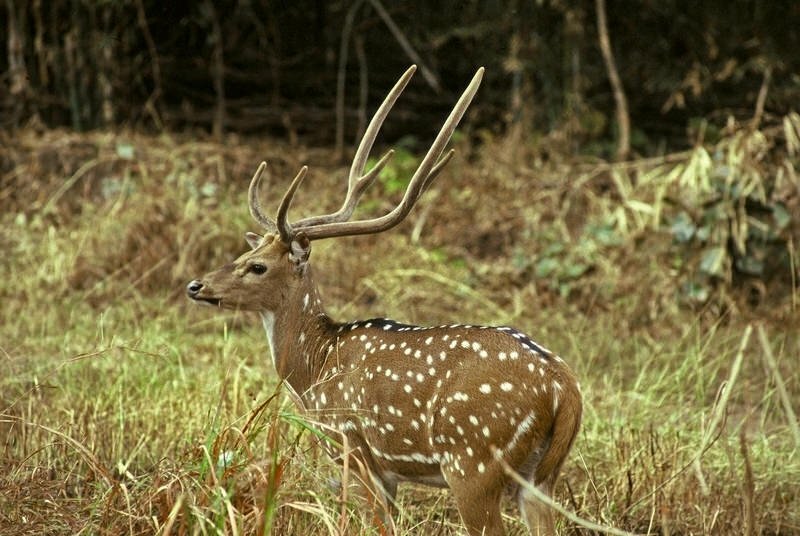 It is the most endangered deer in India and it found only in Kanha. The population here recovered from a low 66 animals in 1970 to 450 – 500 in 2000. 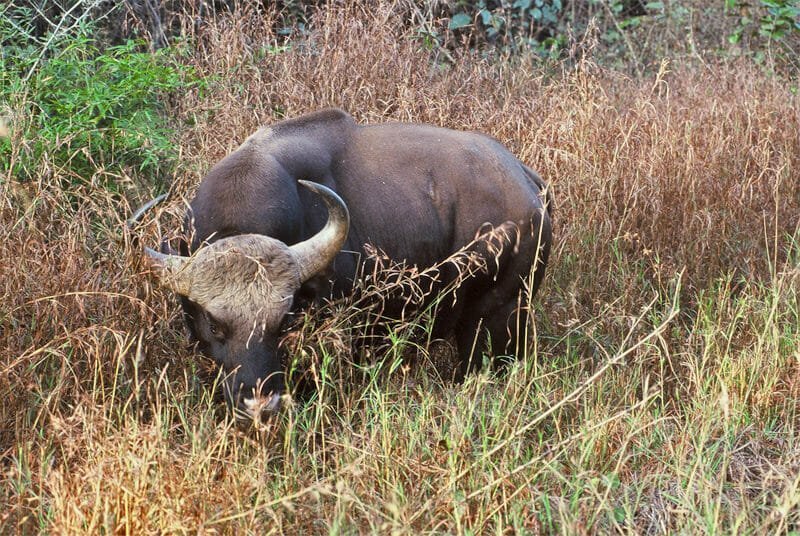 Other animals we regularly saw in the park were: Chital deer, Sambar deer, Golden jackals, Gour or Indian Bison. 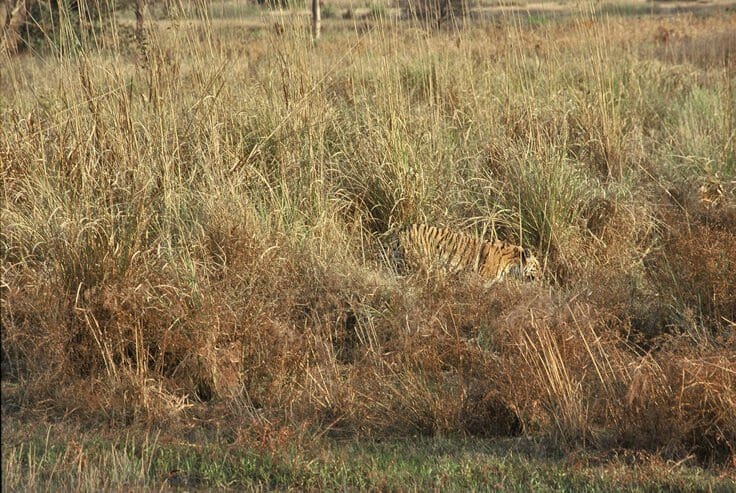 One afternoon we had a distant sighting of a Jungle cat concealed in tall grass. 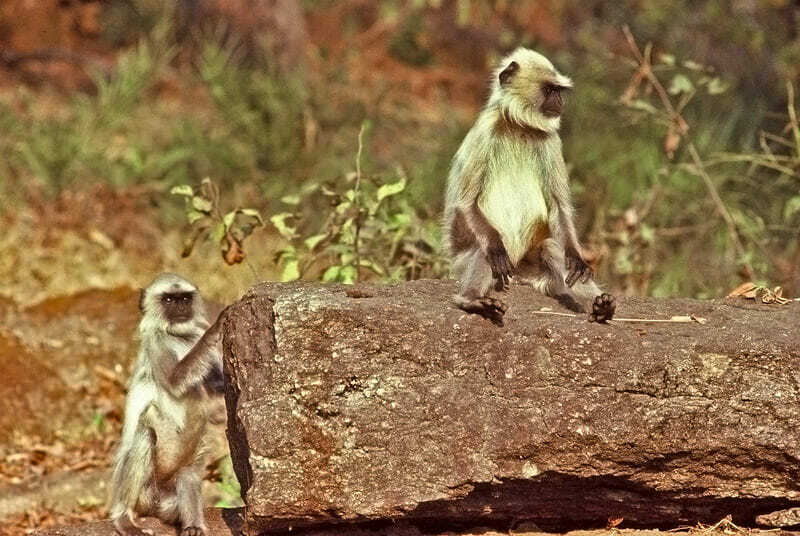 The Common Langurs are also very common in the park. They live in troops of 10 – 30 animals of related females. Such troops, usually led by a single adult male, are noticeably territorial. 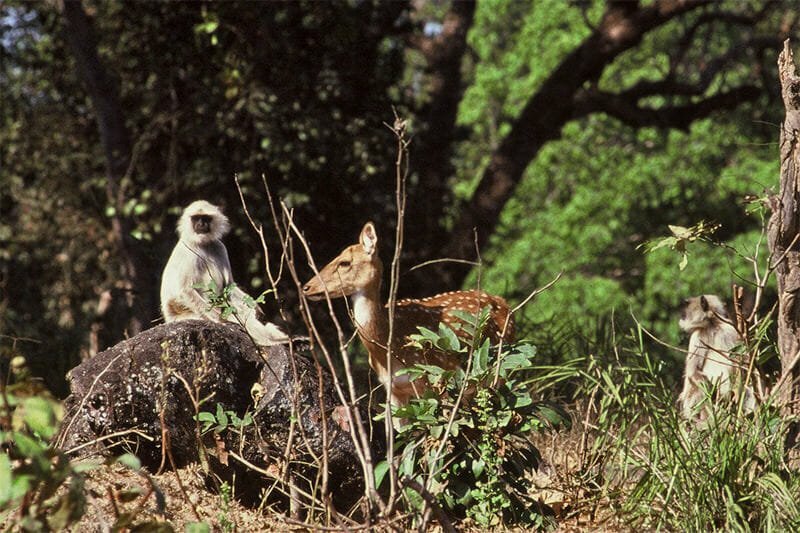 Chital are often found in the company of langurs, these two species have formed a curious partnership. As langur feed, they discard fruit and leaves from the trees, which are then picked up and eaten by chital; and their alarm calls also warn chital of the approaching danger. Similarly when monkeys come down to feed on the ground the deer’s keen sense of smell provides extra security. The most interesting bird that I was in Kanha was an Egyptian vulture. There were also a lot of colourful birds, such as Peacocks and Indian rollers, but just like in Ranthambhore, I was so intent on spotting tigers, that I missed more birds than I saw. 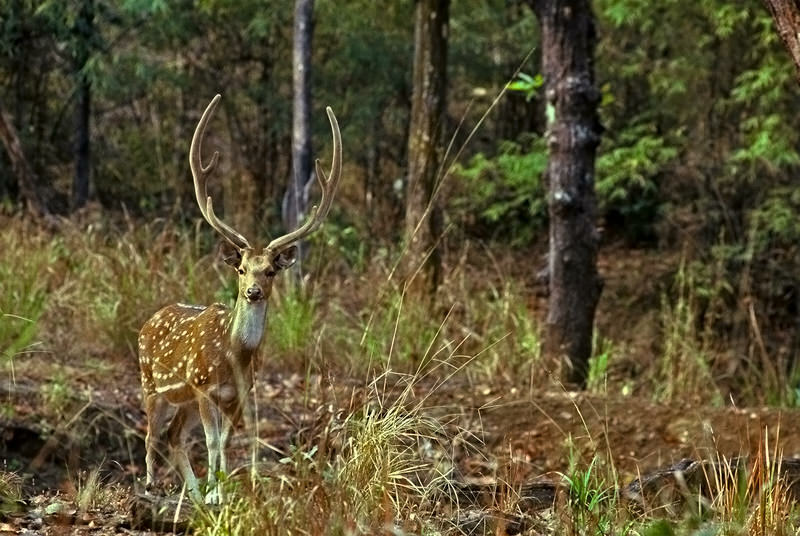 The closest city to Kanha is Jabalpur in the central Madhia Pradesh. From Jabalpur catch a bus that goes all the way to Kanha. Explore the park and stay at the eco-friendly Kanha Village Eco Resort to support the local sustainable tourism initiative. Wonderful blog. Loved all the photos. 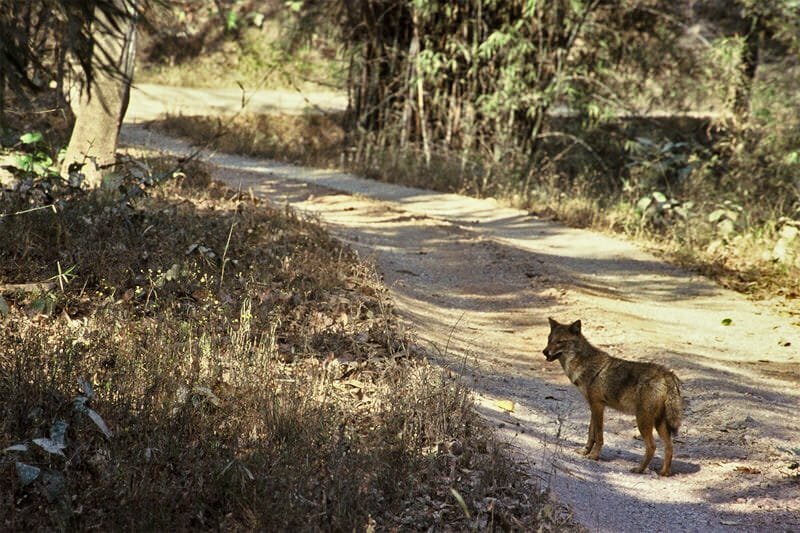 Nice informative article on Kanha National Park in India. However some changes have been made in safari rules and regulations. Thank you Uday. Yes, I am sure things have changed. Must be time to re-visit the park!